One of the ‘fun’ parts of my job as the NYS Blue Book Editor (and as a collector of NY OA), is the discovery of previously uncatalogued issues. The Williamsville TOR held each September just outside of Buffalo has proved a fertile ground for new discoveries. 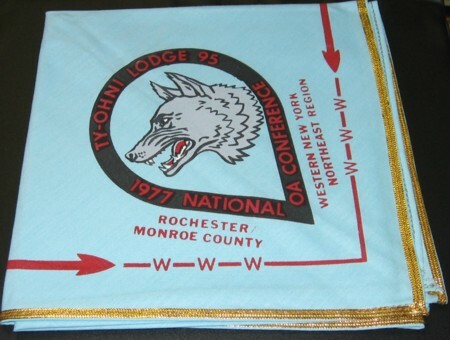 I wrote up a Ty-Ohni 1977 NOAC neckerchief back in September 2006 which had only been added in Blue Book VI. Now another version has appeared. Mike Knittel shares the image and the following information. 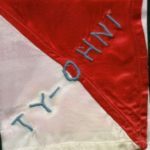 Each contingent member was given several of the red bordered neckerchiefs to trade, however there was a gold bordered version which was given one per contingent member to wear at the event. 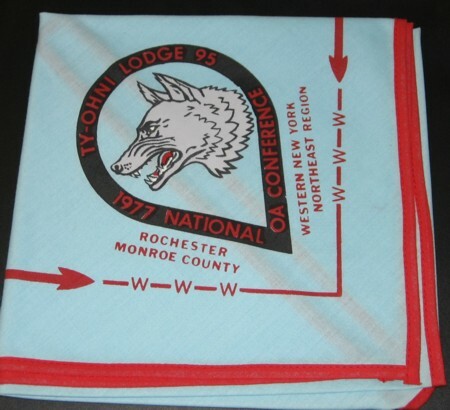 Ty-Ohni Lodge #95 1977 NOAC Delegate Neckerchief? Can anyone else provide further information?